The Duplicate IP Addresses feature always displays 0.0.0.0 for the subnet mask. Please see the picture below. I am using a DLink DUB-E100 USB 2 Ethernet adapter. The function itself works in the software, but displays wrong. My subnet is 255.255.255.0 (see picture). We are running WinPCap v4.1.3. We have seen a similar behaviour with Win10Pcap. It looks like for some adapters (or in some circumstances) the WinPCap library doesn't return the network mask. Instead it returns an empty string, which is the 0.0.0.0 that you see. Our IM department sends this installation as a package to my machine. 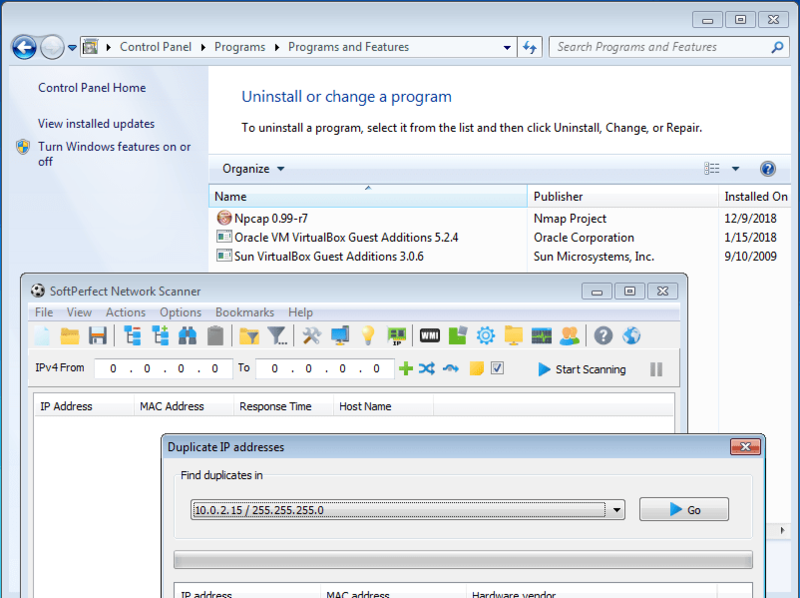 Netscan and WinpCap are automatically installed. What I found regarding the subnet mask being 0.0.0.0 in the duplicate IP address detection was that I had Win10pCap already installed prior to the package installation. So I guess maybe those two packages were conflicting if they were both installed. After uninstalling Win10pCap, the issue of the 0.0.0.0 subnet is gone. I had done some further testing with only Win10pCap installed, and the issue came back, so it appears be a Win10pCap issue. I also tried the new NpCap (per the update on WinpCap website) configured for WinpCap compatibility mode (selected at installation), but that did not work. The adapter list was blank. No message from the software WinpCap wasn't installed. The preliminary build can be downloaded here.